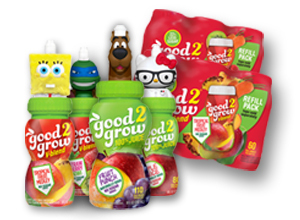 Good2Grow Juice Drinks for kids review! When we found the Good to Grow Juices we were so excited! Our almost 3 yr old is not a huge juice drinker. She loves fruits and vegetables, but she is not given juice very often, it just has too much sugar. 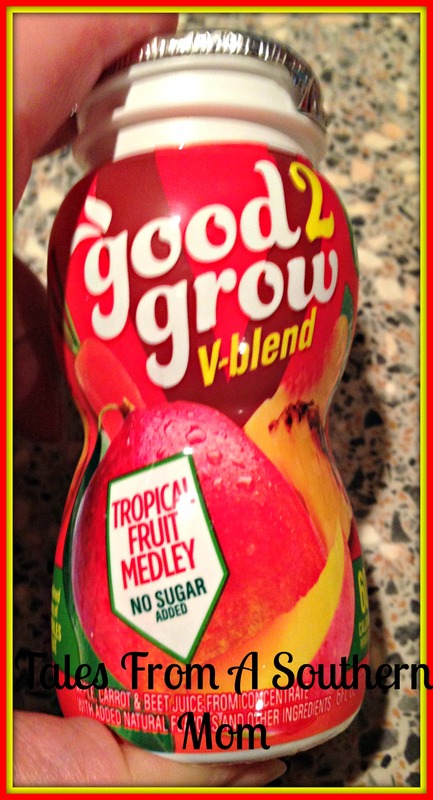 When we found that this had both veggie and fruit juices in it and no added sugar, along with the fact that they included NO high fructose corn syrup, we wanted to try them. The juice containers themselves come in three different sizes, 4 oz, 6 oz, and 8 oz, so there is one for every size thirst and every size kid. The tops are these really cute animated characters that do not spill, ever! Trust me when we say ever, we mean it, as for some reason everything liquid in our house gets spilled no matter what. The best part of the lids is they are dishwasher safe and reusable, when you buy the refill packages the tops are foil so you can just tear those off and re-use the character sippa-top. They have Disney, Dora, Spongebob, Barbie, and so many more to choose from. We let her choose which character she wanted, and of course Mickey Mouse won out, we also bought two different refills, one was the all fruit juice punch flavor and the tropical veggie and fruit blend. I tasted them and they were pretty good. She seemed to really enjoy them, and for us they worked as a get in the car kind of grab and go treat. If organic is important to you and your family the apple juice flavor is 100 % Certified Organic. I know apples are one the dirty dozen list so it is important to us to only use apples and apple products that are certified. The price point on these are pretty reasonable with the cheapest I have found at 2.50 for a six count refill and a high at about 3.80 for a 6 pack refill, the higher price was also on the 8 oz size. I think that juice is still high in sugar, just naturally occurring, but I do like to have a great cute, option that she loves, that is pure juices with no ADDED sugars, once in a while its a great treat, that still provides the nutrients of fruits and veggies. Try them out, I think you will like them much better than juice boxes and pouches that have added sugar and spill everywhere, just trying to pick them up. Stop over at good2grow.com and find out where they are sold near you.